The Rhino Multi-Pro , it is powered by a Honda 4-cycle engine, but the Multi-Pro has been engineered with increased driving dynamics needed to drive larger posts and versatility to take on more post driving applications. 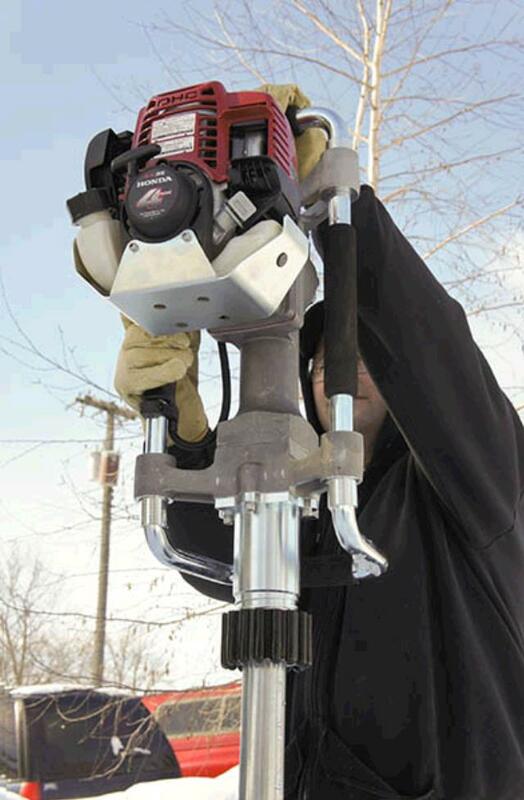 The design includes ergonomically balanced cushioned grip handles, Rhino CIS anti-vibration dampening, Rhino Tension Grip crankcase cover for fast inspection and maintenance, and the Rhino Chuck-Lok Adapter System that allows the operator to quickly install post adapters in the field, ranging in application from 1 to 2-3/8 round posts. The Multi-Pro versatile external chuck design can be configured for driving 1.2-4 lb channel post, tent stake, or 1-3/4 to 2-1/2 square sign post and square post sign anchor with a drive cap. * Please call us with any questions about our post driver gas 40lb class rentals serving Bensenville IL, Lombard, Des Plaines, and the Chicagoland Suburban Area.